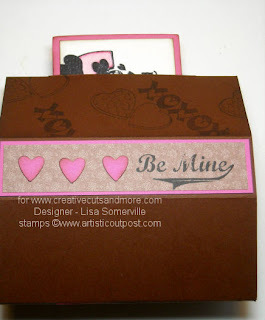 Looking for some quick and easy ideas for creating your Valentine's? With Creative Cuts and More's Exclusive Standing Pop Up Die Cut, creating these cards is a breeze! 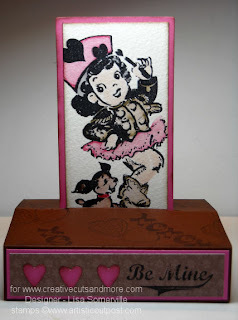 I randomly stamped my images from the Artistic Outpost Vintage Valentine in Soft Suede on the Bazzill Chocolate Cream Base (top panel only), sponged the edges and creased as indicated. I replaced the White Panel with a piece of Watercolor paper, stamped my image in Black Archival, then colored using the Marker Watercolor Technique. Sponged the edges, then adhered to the Bazzill Watermelon Sensation panel. To finish my card, I adhered a piece of pattern paper to a Watermellon Sensation panel, stamped my sentiment in Black, punched a few hearts from my scraps, sponged the edges and adhered in as shown. These cards are great, because they fold flat for mailing! Hot diggity dog, is that somethin' or what! I think that is so much fun! Gotta' go check them out. Cute project Lisa! what a super sweet card Lisa. i love your work and thought I would stop by and let you know.